John Sparks has been recognized nationally as a Top 100 Social Media Power Influencer and one of the Top 50 Most Valuable Social Media Influencers in the country. 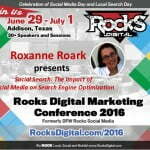 He has an extensive background in Twitter, online marketing and social selling. John is a veteran journalist and has an extensive media background, working for some of the top television news stations in the country, including Dallas, Houston, Tampa and Orlando. He has provided both social media marketing strategies and sales strategies through his company Online ImageWorks for media personalities, celebrities, small business owners and a number of Fortune 500 companies. John is the #1 best-selling author of 365 Ideas To Go From Good To Great On TWITTER! He is also an adjunct professor teaching courses at The Mayborn School of Journalism at The University of North Texas. How to Make Money & GROW BIG on TWITTER! When used effectively, Twitter can be a hot prospecting tool, which can translate into cold hard cash for both you and your business. Using Twitter alongside a few lesser-known, third party tools and applications can transform you into a force to be reckoned with on social media. It’s all too easy to forget the core reasons why social media tools like Twitter are important and can help you and your business. John will explain WHY it’s important to be active on Twitter and what it means to be active on Twitter. 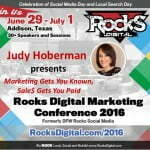 This power-packed, informational session is for everyone from newbies to advanced users. 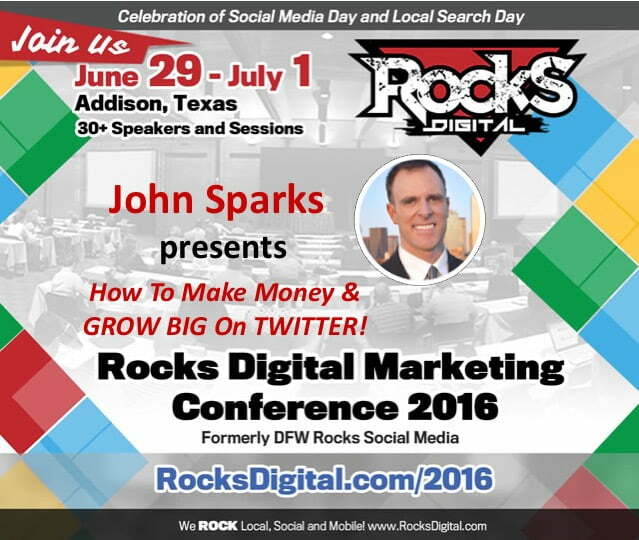 #SocialMedia Influencer @IAmJohnSparks presents at #RocksDigital 2016 on #Twitter!